12. Monash University has a very interesting website that provides detailed information on sea levels from roughly 100,000 ya to the present, coupled with a map of the Sahul. It's interactive, so you can run your mouse over the timeline to see where sea levels were at any given time and how they affected what is now New Guinea, Australia and Tasmania. As we can see from the map, sea level rose very rapidly from about 25,000 ya to roughly 7,400 ya. when it reached more or less the same level it has today. Extrapolating backward, we can imagine the situation as it may have existed, according to the hypothesis I'm exploring, once the three regions were completely separated: 1. Australia would by then have been largely populated by Australoid peoples similar to those who now form the great majority of Australian aboriginals; 2. the Queensland tropical forest could have served as a refuge area for a small segment of the original "Negrito" population; 3. Tasmania, now an island, could have been another refuge for descendants of the same original group; 4. New Guinea would have been populated largely by refugees, descended from the original Sahul settlers, living mostly in the mountains, surrounded by Australoid "invaders" living along the coast. 13. At some point, a form of agriculture characterized by simple gardening (horticulture) develops in New Guinea, either among the highland "Negritos" or the coastal "Australoids," and spreads rapidly throughout the island. Australia, now largely or completely separated from New Guinea, is unaffected by this development and the Australians remain hunter-gatherers right up until first contact with the West. 14. Because Australia is largely flat terrain and also because of the remarkable ability of Australian aborigines to walk great distances, the entire continent tends toward a remarkable homogeneity, both morphologically and culturally. For example, a single language family, Pama-Nyungan, dominates almost the entirety of the continent, in contrast to New Guinea, which currently harbors over 1,000 languages divided into "about three dozen language families and close to the same number of language isolates" (The Languages of New Guinea, William Foley). 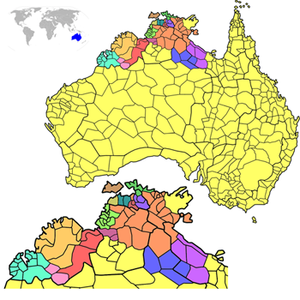 The very different distribution pattern for language families in Australia is clearly visible in the following map (from the Wikipedia article, Indigenous Australian Languages). The huge yellow region is where Pama-Nyungan languages are spoken, while the much smaller, multi-colored region to the north contains just about every other language family on the continent. Significantly, these northern languages are located just to the south of where an enormous land bridge once connected Australia and New Guinea (see map on Post 297). It's tempting to speculate that this northern region might once have served as a refuge area for groups of besieged "Negritos," possibly a jumping-off point for the voyage north. 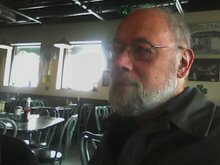 If the invaders ultimately captured their women, taking them as wives, it's possible that their languages might have survived the destruction of the rest of their culture. 15. The striking difference between the linguistic pictures for the two islands is paralleled in the realm of music, with New Guinea currently harboring a variety of different vocal styles, with a wide range of different polyphonic types, some with strong African echoes, and a large number of different instruments and instrumental ensembles, while native Australian vocalizing, almost exclusively monophonic and highly iterative, is remarkably homogeneous stylistically, with only a very few relatively simple instruments, aside from the Didgeridoo, which is rarely performed in ensembles of any kind. It's important to recognize, however, that within the very broad limits of the style I've called "unison/iterative/one-beat" there is considerable diversity among various Australian groups, and also a very impressive degree of subtlety, rhythmic intricacy and structural elaboration, often coordinated with some of the most remarkable poetry and dancing to be found anywhere in the world. When we couple this with some of the most complex and intellectually challenging ritual, mythical, and genealogical traditions to be found anywhere in the world, along with equally remarkable visual art traditions, which even today can challenge the finest examples of Western art, it should be clear that when I characterize Australia as culturally "homogenous" this should not be construed as implying that these traditions are in any way simplistic or inferior. I'll have more to say about the music of Australia and New Guinea in future posts. 16. The next important event in the history of this region is the advent of the so-called "Austronesians," who are thought to have migrated to various points in New Guinea and Island Melanesia anywhere from 6,000 to roughly 4,000 years ago. The origin and early migration routes of the Austronesians remain a much-debated mystery, which need not concern us here. For some reason there is little if any evidence that any Austronesians ever landed anywhere in Australia, possibly due to the protective function of the Great Barrier Reef. However, they did land in New Guinea, where a great many Austronesian languages are spoken today, though almost exclusively in certain lowland areas, along the northern coast. Apparently, the newly arrived Austronesians displaced the New Guinea natives living along the coast, with results that are complex and only partly understood even today. In some cases it would seem as though the native populations remained put, but adopted Austronesian languages and also farming techniques. In other cases, it's almost certain that at least some groups took to the highlands, which once again would have served as a refuge area. As far as the scenario I'm developing is concerned, the "native" populations along the coast would at that time have been largely Australoid groups (see paragraph 11 in Post 305), while those inhabiting the highland regions would have been the descendants of the original "Negrito" settlers. With the advent of the Austronesians, therefore, and the retreat into the highlands of at least some of the Australoid groups, the highlands would have come to harbor a mixed population, partly of "Negrito" origin (though by now probably for the most part no longer Pygmoid) and partly of Australoid origin. Since these groups would have formerly, according to my scenario, been bitter enemies, it's not difficult to see how the endemic warfare we now see in the New Guinea highlands could have originated at this point.